Album Review: Panic! at the Disco’s Too Weird to Live, Too Rare to Die! Too Weird to Live, Too Rare to Die! is Panic! at the Disco’s fourth studio album and second since the band’s split in 2009. Their latest is an ode to their Las Vegas roots and sports a vintage, mostly ‘80s-inspired sound. Here’s a track by track breakdown before the CD releases this Tuesday. Too Weird to Live, Too Rare to Die! opens with their second and most recent single. “This is Gospel” begins with a heartbeat and a somber, slightly autotuned (sound quality autotuning that is, not vocal-perfecting) verse. That breaks into the emotional chorus with “If you love me let me go” back by strong instrumentation. With its themes of being trapped and the dangerous nature of words, this is one of the best songs on the album. The first single off the album is a haunting, darkly ambiguous theme with a repetitive, catchy chorus. Guest vocalist Lolo’s part adds a creepy, music box-like quality to the already uneasy melody. This high energy track directly addresses the subject of the album—Las Vegas. A chorus of children counting kicks off the song and is woven into the lyrics. Considering that the title seems to be on the lighter side, “Girl That You Love” rocks some vintage dissonance. Its ‘80s-inspired sound would be perfect in a movie. Sound-wise, the fifth song on the album harkens back to A Fever You Can’t Sweat Out-era Panic!, though the lyrics are decidedly simpler. While likening a negative relationship to an addiction hardly seems like the most original concept, it’s fun and energetic. Holy synth work, Batman. Talk about inspired by the ’80s. About a lovesick boy who doesn’t want to be a girl’s heterosexual cover anymore, “G/G/B” is a solid track that imbues some LBGT support into the album (“Girls love girls and boys/And love is not a choice”). I can’t help but think of what a good young adult book this song would make. This track starts with a cautionary recording about overly friendly strangers, leading to a unsettling, surprisingly simple song. Definitely a favorite of mine. The synthesizer strikes again! I wasn’t a big fan of this one—the lyrics don’t seem to connect to one another and there’s too much going on in the background. Some heavier editing would be welcome. “Collar Full” is the happiest song on the album. It describes a positive experience in a relationship, despite the wording in the below lyrics. I wish I knew where the title of this one came from. This is the only slow song on the album. Normally I prefer my songs fast, but I have a soft spot in my heart for Panic! at the Disco’s slower tracks. Unfortunately, I found this one to be lacking. The lyrics are so sparse and the vocals are slightly auto-tuned—I think I would feel differently if the vocals were stripped down. However, the accompanying piano and strings are both very pretty. Overall, Too Weird to Live, Too Rare to Die! starts out strong, holds through the middle, and kind of drifts at the end. However, all of the pieces seem like they connect to create a whole, cohesive album heavy on the synth and ominous themes. The lyrics are decidedly less verbose than those of previous Panic! albums. 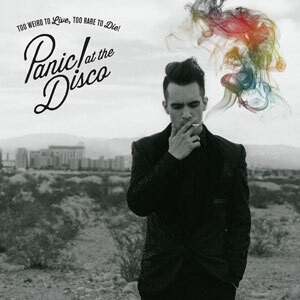 Part of this can be attributed to the band’s split a few years ago, since principle lyricist Ryan Ross left the bad, though Vices & Virtues seemed to be a bit wordier than this latest installment. Even with some issues, it’s a solid listen. Too Weird to Live, Too Rare to Die! will be available everywhere October 8th!